Why John Paul II Loved Mary? Mooched off this travel blog. Best picture I’ve seen of this awesome statue! Yesterday I finished the first book I’ve ever read by then Cardinal Joseph Ratzinger. I’m quite proud of myself. This isn’t the first one I’ve started. One of the Lay Dominicans in my chapter has made the argument that Pope Emeritus Benedict XVI will one day be declared a Doctor of the Church. To be declared a Doctor of the Church, you have to be someone that people generally agree wrote or spoke in such a way as to clarify or develop Christian doctrine. Many commentators have pointed out that Benedict XVI was much more of a scholar and professor compared to his more charismatic predecessor St. John Paul II or successor Francis. This is very apparent in all of his writings, this book being no exception. Even for someone like me with a Master’s degree in church stuff, I could only take this book in small chunks with long breaks. I highly recommend reading until it doesn’t make sense anymore then put it down. When you pick it back up with a fresh mind, it’ll all make perfect sense again. It’s dense. As he explains in the introduction, it’s basically three college lectures elaborated, revised and edited into book form. It’s only 90 pages, the last 10 or so of which are end-notes. Might come to set us free. And saved us from our sin. It was a very appropriate book to work on last week during the Feast of the Nativity of Our Lady. If you would like to better understand how the Catholic faith fits into the Old Testament, give this book a chance. If you’d like to understand the role of Our Lady better especially in light of her identity as a Jewish woman, give this book a chance. If you wish you could brag to all your intellectual friends that you’ve read something by Benedict XVI, give this book a chance. I’m glad I did for all of those reasons. Daughter Zion is hard to find unless you look online. It is available in e-book and paperback format from several sources. You just need to let your fingers do the walking. Three words sum up Mary’s attitude: listening, decision, action. They are words that point out a way for us too as we face what the Lord asks of us in life. Listening, decision, action. 1. Listening. What gave rise to Mary’s act of going to visit her relative Elizabeth? A word of God’s Angel. “Elizabeth in her old age has also conceived a son…” (Lk 1:36). Mary knew how to listen to God. Be careful: it was not merely “hearing”, a superficial word, but it was “listening”, that consists of attention, acceptance and availability to God. It was not in the distracted way with which we sometimes face the Lord or others: we hear their words, but we do not really listen. Mary is attentive to God. She listens to God. However Mary also listens to the events, that is, she interprets the events of her life, she is attentive to reality itself and does not stop on the surface but goes to the depths to grasp its meaning. Her kinswoman Elizabeth, who is already elderly, is expecting a child: this is the event. But Mary is attentive to the meaning. She can understand it: “with God nothing will be impossible” (Lk 1:37). This is also true in our life: listening to God who speaks to us, and listening also to daily reality, paying attention to people, to events, because the Lord is at the door of our life and knocks in many ways, he puts signs on our path; he gives us the ability to see them. Mary is the mother of listening, of attentive listening to God and of equally attentive listening to the events of life. 2. The second word: decision. Mary did not live “with haste”, with breathlessness, but, as St Luke emphasizes, she “kept all these things, pondering them in her heart” (cf. Lk 2:19, 51). Moreover, at the crucial moment of the Angel’s Annunciation, she also asks: “how shall this be?” (Lk 1:34). Yet she does not stop at the moment of reflection either. She goes a step further: she decides. She does not live in haste but “goes with haste” only when necessary. Mary does not let herself be dragged along by events; she does not avoid the effort of taking a decision. And this happens both in the fundamental decision that was to change her life: “I am the handmaid of the Lord…” (cf. 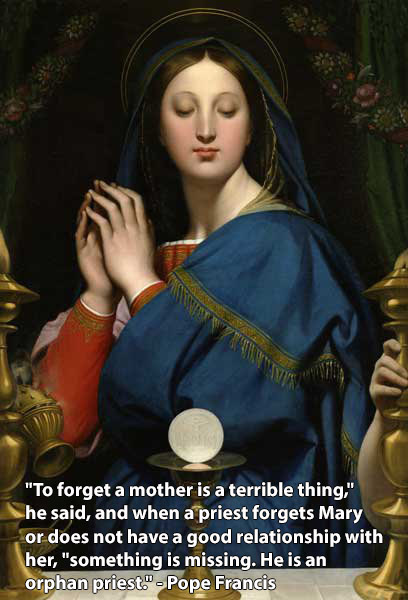 Lk 1:38), and in her daily decisions, routine but also full of meaning. The episode of the wedding of Cana springs to my mind (cf. Jn 2:1-11): here too one sees the realism, humanity and practicality of Mary who is attentive to events, to problems. She sees and understands the difficulty of the young married couple at whose wedding feast the wine runs out; she thinks about it, she knows that Jesus can do something and decides to address her Son so that he may intervene: “they have no more wine” (cf. v. 3). She decides. It is difficult in life to take decisions. We often tend to put them off, to let others decide instead, we frequently prefer to let ourselves be dragged along by events, to follow the current fashion; at times we know what we ought to do, but we do not have the courage to do it or it seems to us too difficult because it means swimming against the tide. In the Annunciation, in the Visitation and at the wedding of Cana Mary goes against the tide. Mary goes against the tide; she listens to God, she reflects and seeks to understand reality and decides to entrust herself totally to God. Although she is with child, she decides to visit her elderly relative and she decides to entrust herself to her Son with insistence so as to preserve the joy of the wedding feast. 3. The third word: action. Mary set out on a journey and “went with haste” (cf. Lk 1:39). Last Sunday I underlined Mary’s way of acting: in spite of the difficulties, the criticism she would have met with because of her decision to go, nothing could stop her. And here she leaves “with haste”. In prayer, before God who speaks, in thinking and meditating on the facts of her life, Mary is not in a hurry, she does not let herself be swept away by the moment, she does not let herself be dragged along by events. However, when she has clearly understood what God is asking of her, what she has to do, she does not loiter, she does not delay, but goes “with haste”. St Ambrose commented: “There is nothing slow about the Holy Spirit” (Expos. Evang. sec. Lucam, II, 19: PL 15,1560). Mary’s action was a consequence of her obedience to the Angel’s words but was combined with charity: she went to Elizabeth to make herself useful; and in going out of her home, of herself, for love, she takes with her the most precious thing she has: Jesus. She takes her Son. We likewise sometimes stop at listening, at thinking about what we must do, we may even be clear about the decision we have to make, but we do not move on to action. And above all we do not put ourselves at stake by moving towards others “with haste” so as to bring them our help, our understanding, our love; to bring them, like Mary, the most precious thing we have received, Jesus and his Gospel, with words and above all with the tangible witness of what we do. Mary, the woman of listening, of decision, of action. Mary, woman of listening, open our ears; grant us to know how to listen to the word of your Son Jesus among the thousands of words of this world; grant that we may listen to the reality in which we live, to every person we encounter, especially those who are poor, in need, in hardship. 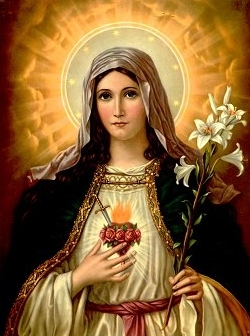 Mary, woman of decision, illuminate our mind and our heart, so that we may obey, unhesitating, the word of your Son Jesus; give us the courage to decide, not to let ourselves be dragged along, letting others direct our life. Mary, woman of action, obtain that our hands and feet move “with haste” toward others, to bring them the charity and love of your Son Jesus, to bring the light of the Gospel to the world, as you did. Amen. 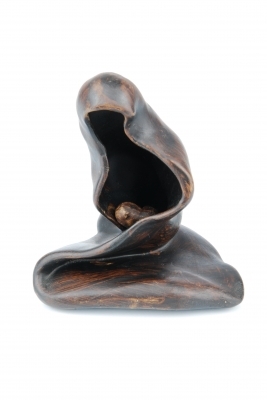 A statue of Mary, hollow and open to the world. Imagine for yourself: A 13-year-old middle-eastern girl sitting at home, minding her own business. Maybe she’s doing chores. Maybe she’s studying. It won’t matter in a few moments what she is doing, because her life is about to change forever. An angel comes to her. Now, she’s heard about angels from her parents and from services in the synagogue. She knows that angels are messengers from God. She’s heard about Abraham and the three messengers (Genesis 18). She knows that angels bring news of new life (Genesis 18:10) and of destruction (Genesis 18:20). What will this angel tell her? The Lord is with you, what is that supposed to mean? The angel points out that her cousin who was barren is now pregnant. If God can do this, surely He can do as He has promised to her. Hence began the most important chapter in the history of the world. Mary risked her own life bringing Jesus into the world. Let alone the risk of stoning, the maternal mortality rate was through the roof in this time prior to modern medicine like antibiotics and blood transfusions. She wasn’t just agreeing to 40 weeks and a dangerous delivery either. She was agreeing to a lifetime of change. She had to raise him. She had to follow him as he traveled the countryside preaching and healing. She had to watch her Son die. Today is Mother’s Day. Women daily make sacrifices like Mary made in giving birth, raising a child and, sometimes, even tragically seeing that child die. Motherhood requires a complete self-sacrifice, a complete emptying of the self, to make room for new life to grow and prosper. It is one of the hardest, and the most rewarding, things that a woman can do. Originally appeared at Ignitum Today. See Mary seated on her glorious throne, the Christ child standing on her lap. She looks down upon us with great care and compassion. Her hand is raised as if she is fending off anything that could harm us. The Christ child, on the other hand, is patiently awaiting the time he gets to drop the olive branch. This statue was made under the direction of Pope Benedict XV at the end of World War I. The war decimated Europe and everyone hoped that it would never happen again. There is still so much violence in the world. The genocide of Christians in Iraq, the senseless violence against schoolchildren in Nigeria, unaccompanied children running away from the cartel violence in Mexico, forced abortion in China, and mass killings at our own backdoor, only to name a very few. Most holy and immaculate Virgin, Mother of Jesus and our loving Mother, being his Mother, you shared in his universal kingship. The prophets and angels proclaimed him King of peace. With loving fervor in our hearts we salute and honor you as Queen of peace. We pray that your intercession may protect us and all people from hated and discord, and direct our hearts into the ways of peace and justice which your Son taught and exemplified. 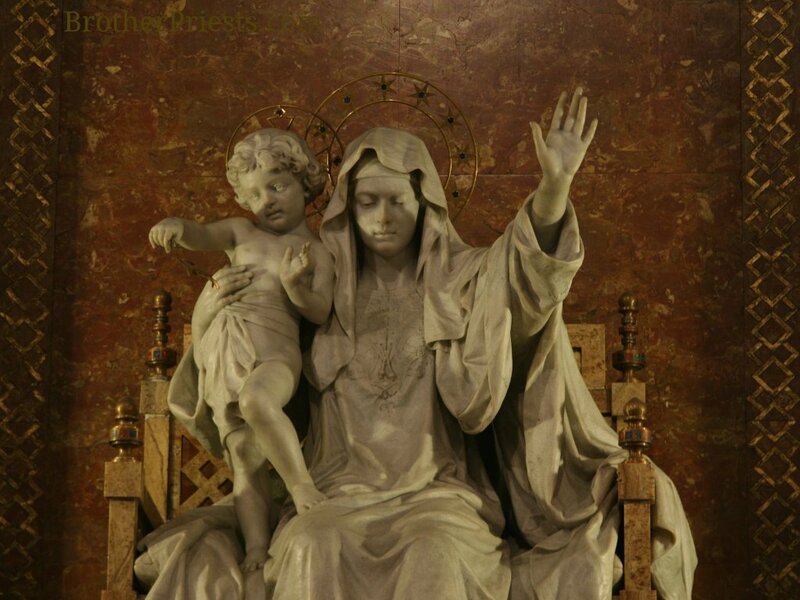 We ask your maternal care for our Holy Father who works to reconcile the nations in peace. We seek your guidance for our President and other leaders as they strive for world peace. Note: I will return to my series on Emily Letts soon. I’m just having a lot of trouble writing part 3.